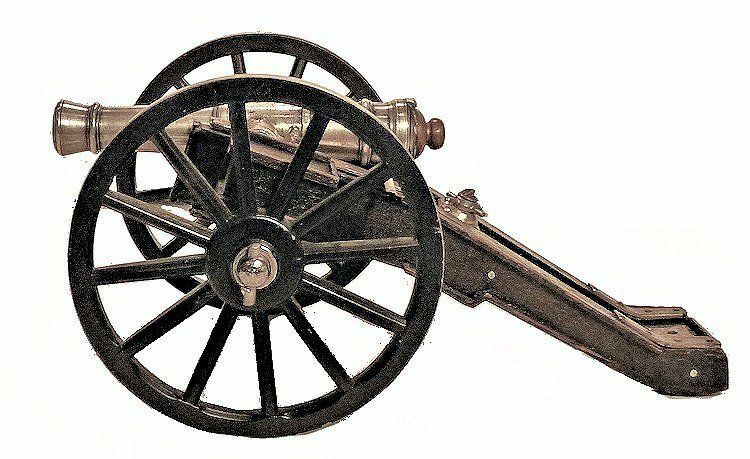 Presented is a seemingly one-of-a-kind Sterling Silver miniature English field artillery breech loading field cannon Ca 1854 with presenation engraving. When received, it was fitted to a ship style wood carriage having some age, but which does not belong to a tube with an Army affiliation as shown below. Consequently, we substituted a contemporary field style carriage from our collection which is almost the correct scale. The choice of carriage will be left to the buyer with the field carriage being slightly more. 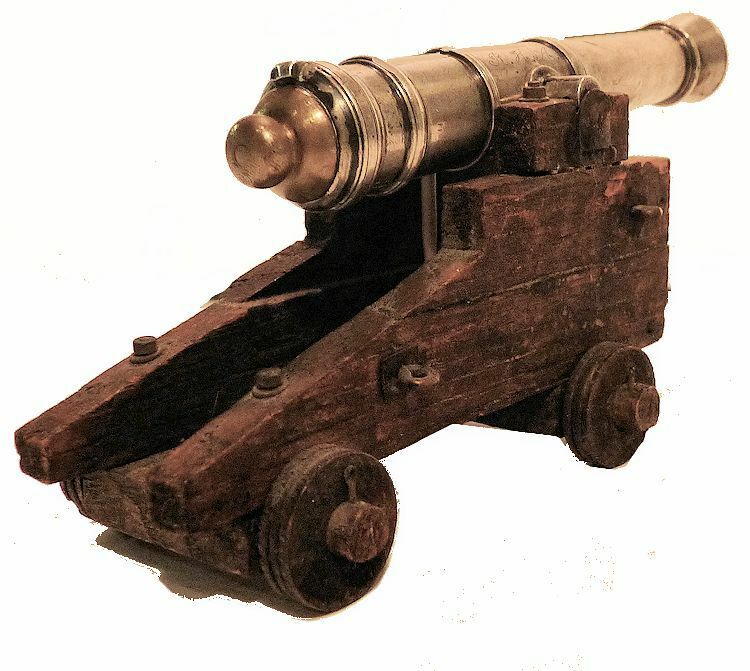 The barrel weighs 85 grams, and measures 4 1/2" long, with its widest point being .67" in diameter. 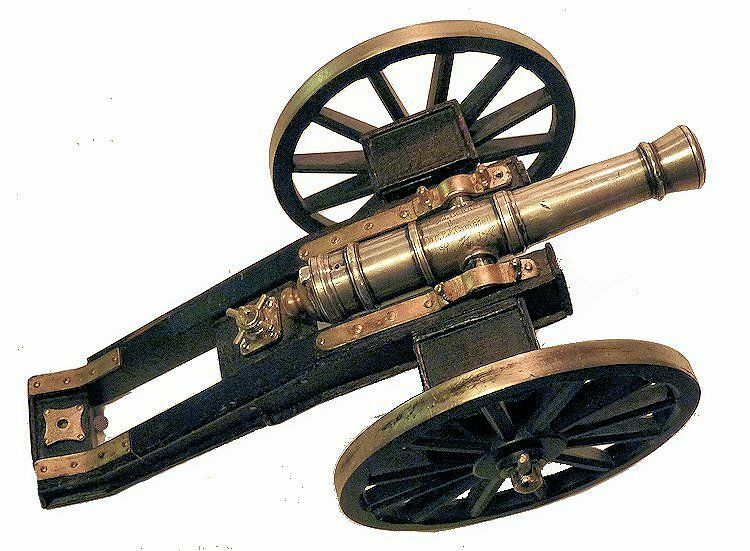 The brass breech is removeable and does not have a locking mechanism so that this gun cannot be safely fired. Though there are no assayer marks, the tube has been tested and found to be of sterling silver. Along the top of the barrel, between the second and third reinforcing rings, it is engraved: "Presented to Serj' J. Bennett by Capt. P.J. 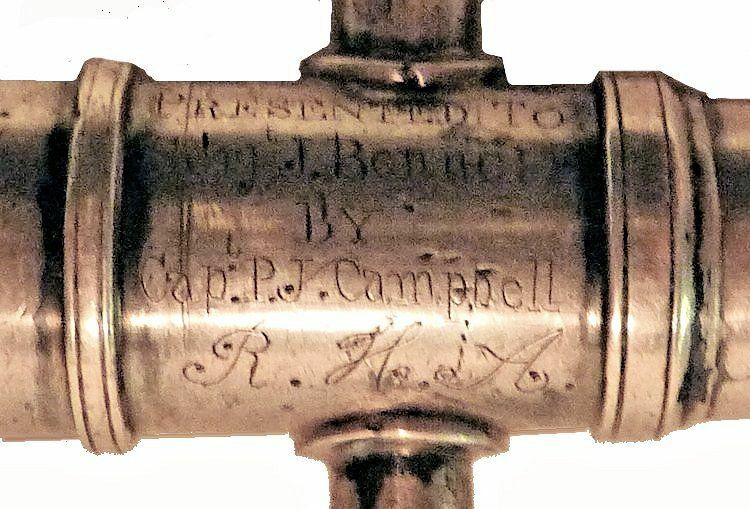 Campbell" on three lines and the acronym, "R.H.A" underneath, standing for Royal Horse Artillery. 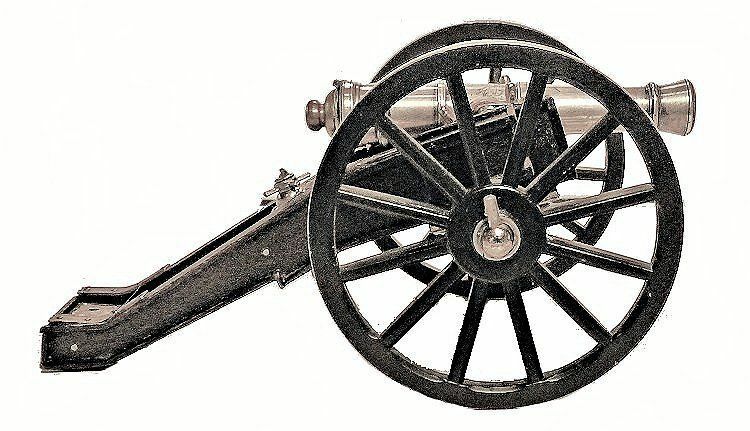 The 6-pound field gun was a lightweight, mobile piece that dates back as far as 1793 and was always a favored field weapon by artillerymen worldwide as shown below. This fine old silver relic cannot be safely fired. Please don't try. 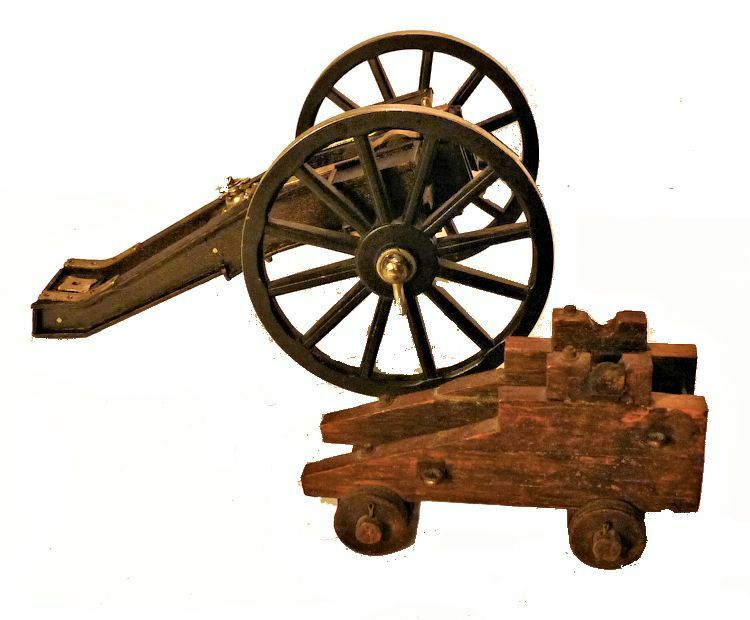 FIELD CARRIAGE CONDITION: The professionally made contemporary wood carriage is in good condition and its pot metal fittings are accurate for the period as can be seen in the picture of the real British 6 Pounder shown above. The wheels are of cast brass. There are no foundry marks or inscriptions on the carriage. There is no method to adjust elevation except by using a small piece of wood such as a tooth pick. SHIP'S STYLE CARRIAGE: The picture below shows the carriage that came with the sterling silver barrel. 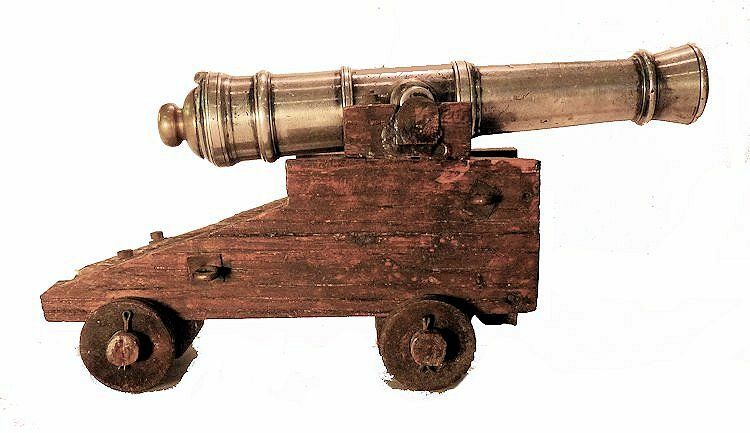 PROVENANCE: This cannon as mounted on the ship's type carriage was said to come from the estate of a man who collected miniature cannons in South Jersey. Even though it was incorrectlly mounted, it was considered the best of his collection which is quite strange since most collectors are expert in their field of interest. Maybe the collector was referring only to the barrel which certainly could be worthy of that description. "COLONEL PATRICK JOHN CAMPBELL, R.H.A., joined the Royal Artillery in October, 1847; proceeded soon afterwards to the Cape of Good Hope, served a year in Natal, and then joined the army in Kaffraria soon after the outbreak of the Kaffir war of 1851-2-3; was employed in numerous engagements and skirmishes, including the attack on Meromo's stronghold, when the 74th Regiment suffered so severely, losing their Colonel (Fordyce) and three officers killed, and many officers and men wounded. On his commanding officer, Major Eardley Wilmot, being killed in action, he succeeded to the command of the Royal Artillery in the King Williams town Division ; was frequently mentioned in dispatches, and was slightly wounded ; at the conclusion of the war returned to England ; was appointed to Royal Horse Artillery, joined Chestnut Troop at Canterbury ; promoted to Captain in 1854. Went to Crimea as Adjutant to Colonel Maclean, March 9, 1855 ; was present in the trenches in both attacks on Redan in June and September. Appointed Captain Royal Horse Artillery, and joined H Troop in Dublin. On the outbreak of Indian Mutiny, accompanied the troop commanded by Colonel J. Turner, to India, but the troop was landed at Madras, and took no part in the suppression of the Mutiny. Served afterwards at Corfu, Chatham, Shorncliffe, and Aldershot ; again re-appointed to Royal Horse Artillery, and commanded Battery at Umballa and Peshawur. Promoted to Lt.-Colonel, October, 1871 ; soon re-appointed to Royal Horse Artillery, and commanded Royal Horse Artillery at Meerut, Rawal Pindee ; succeeded to the command of A Brigade at Head Quarters, and three Batteries in 1875. Promoted regimental Colonel, March, 1880. Medals, Cape; Crimea, with Clasp; Turkish. Serving in Royal Horse Artillery 1881." Almost all the batteries of the Royal Horse Artillery have served continuously since the French Revolutionary Wars or Napoleonic Wars, except the King's Troop which has existed since 1946 and M Battery which was 'reanimated' in 1993. In 1793, in the course of the French Revolutionary Wars, Great Britain and allied European powers declared war on France over French occupation of the Rhine delta and Antwerp, precipitating the Flanders Campaign. Britain remained in conflict with France for almost 22 years, during which time significant progress was achieved in artillery development. :p 24 The first two troops of Horse Artillery (A –later entitled "The Chestnut Troop"– and B) were raised in January 1793 at Goodwood, East Sussex, by the Master-General of the Ordnance, the 3rd Duke of Richmond, to provide fire support for the cavalry. They were joined by two more troops in November 1793. 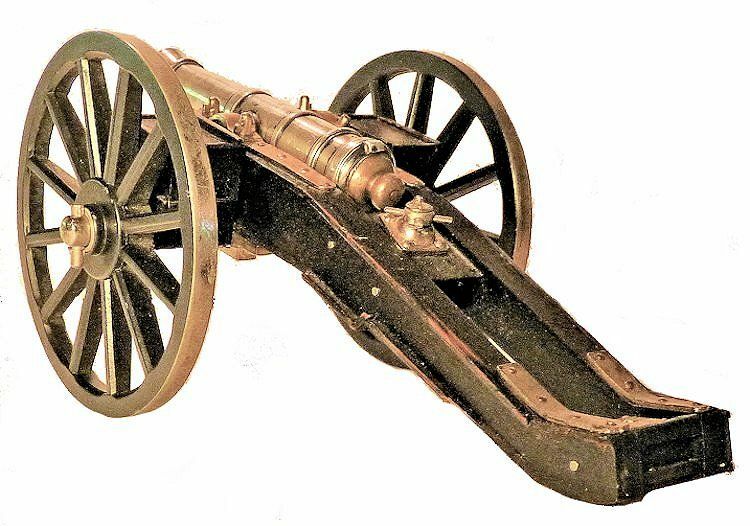 Each troop had six 6-pounder guns. All RHA personnel were mounted. Included in the establishment were 45 drivers and 187 horses, making it the first self-contained fighting unit of artillery. FLAT RATE SHIPPING by FedEx Ground $55.00. OUR UNCONDITIONAL GUARANTEE: If not completely satisfied with your purchase, it may be returned, if without damage, within five days of receipt in its original packaging. Return items must be insured for their full value. A prior email authorization by us for the return is required. Shipping charges are included in this offer within the continental United States and are refundable if due to our error. International buyers welcome, but inquire first. We have satisfied customers in Argentina, Australia, Austria, Belgium, Bermuda, British Virgin Islands, Canada, Chile, Republic of China, Czech Republic, Democratic Republic of Congo, Denmark, Estonia, England, France, Germany, Greece, Holland, Hong Kong, Hungary, Iceland, Indonesia, Ireland, Israel, Italy, Japan, Kuwait, Latvia, Luxembourg, Malaysia, Martinique, Mexico, New Hebrides (Vanuatu), New Zealand, Nigeria, Norway, Nova Scotia, Panama, Philippines, Poland, Portugal, Puerto Rico, Romania, Russia, Saudi Arabia, Scotland, Singapore, South Africa, Spain, St. Maarten, Sweden, Switzerland, Thailand, Turkey, United Arab Emirates, USVI, Vanuatu (New Hebrides) and the Eastern Caribbean. Copyright 2016 Land And Sea Collection™. All Rights Reserved!